Max had previously warned me that houses are "money pits" but I thought this just referred to buying curtains and spending money on other cute decorative items for the home. Oh, how wrong could I be! Now I know he was talking about the not-so-fun and barely even bloggable home needs. First it was our sprinkler system, which decided to start spewing water like Old Faithful. We saved some money as my handy hubby dug up the valves and rebuilt them himself, but money did go into our imaginary pit. Next it was the handles to turn on the showers. We had the opposite problem here as we just could not get our master shower handle to turn the water on (not without pulling with all of our might). My mom reported that the large guest bath shower was almost impossible to turn on. After opening all three shower areas we found that the cartridges behind the handles were completely worn (they were after all almost 20 years old). After a trip to Lowe's we brought back new cartridges and handles (I even installed one almost entirely by myself!) and ended up with showers that turn on easily. But alas we had dropped another $100+ into the money pit. And nothing cute to show, sigh. The exterminator who did the job said the hive had housed about 15,000 bees and that he had taken down 15-20 pounds of honeycomb. 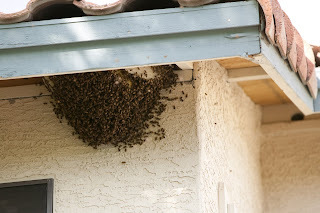 We don't have an after photo since the worker bees who were out working when the hive came down are now swarming around the area that used to be their home, primed for attack. Don't worry, we can go outside again in about a week. How much in the money pit this time, you ask? Two hundred dollars, and still nothing cute to show!